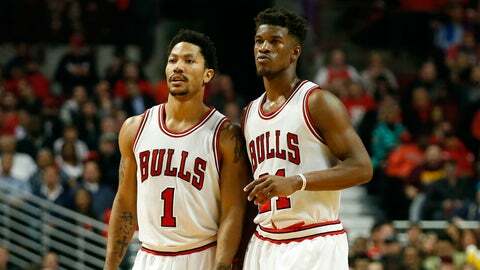 Both Jimmy Butler and Derrick Rose are saying all the right things publicly. Transition can be difficult, especially when it means handing off leadership from one highly visible person to another. Such transition pops up all the time in the NBA, as players get hurt or age and younger guys step in to fill the void. It’s a process in which the Chicago Bulls are squarely situated currently, as Derrick Rose’s injury history and the growth of Jimmy Butler has turned the Bulls from Rose’s team to one guided by Butler. As Rose indicates, Butler had a rough time growing up. His father left the family when he was young, and when Butler was 13 years old, his mother kicked him out of the house. He stayed with friends for weeks at a time as he could before being brought into the home of a friend and teammate. Butler, for his part, has previously told reporters that he doesn’t care "whose team it is" and that he just wants the Bulls to compete for a title.